The University’s anti-racism committee will sponsor two events on Wednesday, March 21, the annual International Day for the Elimination of Racial Discrimination. 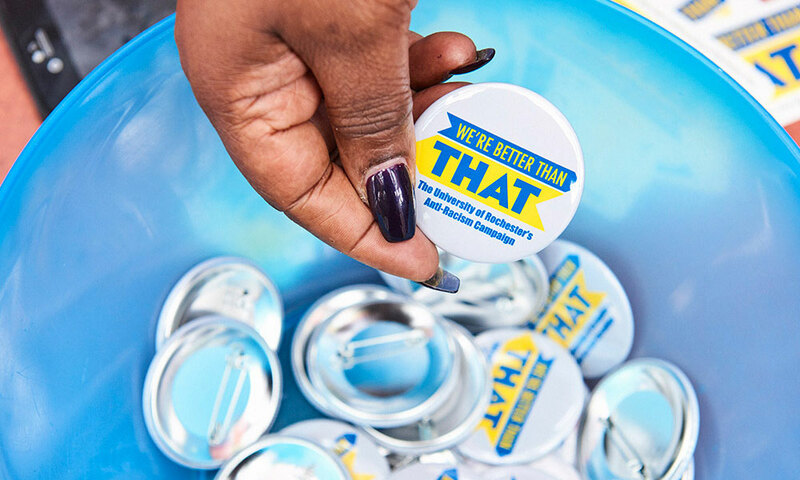 The We’re Better Than That committee will commemorate the day by asking members of the University community to take a pledge to be an “anti-racism warrior” via a digital platform (using their laptop, computer, or smartphone) from 10 a.m. to 2 p.m. The names of those who take the pledge will be displayed in real time on the giant screen in the Rettner Hall atrium. The pledge reads: “I pledge to be an anti-racism warrior by 1. becoming aware, 2. challenging myself, 3. spreading the word, and 4. taking action. The digital platform also will allow members of the University community to ask any questions of the committee, which will be answered on the We’re Better Than That Facebook page. Wednesday evening from 6:30 to 8, the student organization UR United World will hold a discussion in Genesee Hall 325, asking the question, “How does racism affect you?” A student panel will discuss the topic, with Jessica Guzman-Rea, director of the Paul J. Burgett Intercultural Center and We’re Better Than That committee member, serving as moderator along with student committee member Meredith Crenca ’19. The students then will break into smaller discussion groups. Students who join the talk will receive free We’re Better Than That T-shirts. Departments across the University are encouraged to wear their shirts on Wednesday as a show of solidarity against racism. Group photos can be sent to the We’re Better Than That Facebook page.